#1: Maja Cerar performing Doug Geers, and Gregory Beyer and Christina Towle performing Elaine Thomazi Freitas. #2: Joseph Benzola and Crippled Symmetry performing their own works. #3: The Ill Wind Ensemble performing their own works. #6: Ensemble Wireworks performing Manfred Stahnke, Jonathan Harvey, Vinko Globokar, Annea Lockwood, Georg Hajdu, Chris Brown and Dieter Schnebel. #7: The Logos Duo performing their own works. #9: Brian Johnson performing Jospeh Celli, Steve Gryc, Eric Lyon, Ben Passaribu, and his own work. Check out the audio archives and playlists for more info. Best of the Bazaar Mark LXV is ready! Listen to David "Damian" Gunn's collage -- as well as all 65 others for nearly seven hours of questionable entertainment! Did you know most composer pages have audio comments and music clips?. There are hundreds, and we've just posted more by André Posman and Guy de Bièvre. The 2001 Golden Bruce has been awarded. See who deserves this year's award for ignominious behavior in the contemporary arts. It's not who you think. September 11 Musical Gallery add music by Eve Beglarian and Elodie Lauten. A studio performance of Eve's Five Things is joined by the release of Elodie's complete, 16-track S.O.S.W.T.C..
Don't miss our latest shows. Although our live stream isn't back, you can check out our archived shows, which will be broadcasts of the entire Ought-One Festival. The first three concerts, broadcast December 1 and 8, will be up in a few days. Past and potential K&D supporters are invited to read the latest Report to Contributors. The document, which contains a brief history from 1995-2001 and a financial picture of the past year, is in PDF format. Times are rough all around, and K&D's financial support is thinning along with that for other arts groups. So we're selling out! T-shirts, mugs, recordings. So head for out page with items for sale, or click one of the images on the right. CDs from Pogus, Logos, THUMP, Margaret Lancaster, Mary Lou Newmark, Waveformation, James Bohn, MaltedMedia, Frédéric Rossille; Festival T-shirts; Vermont composer mugs; 100-page program/essay book, and special 1- and 3-CD limited editions of "NonPop NoBounds" from on-air K&D performances and presentations. For those waiting: the special editions are done and just about ready to ship! The latest composer up for distortion is Guy de Bièvre. Distort him! Shows #328-338 are now available! Catch up with interviews you missed, along with our special September 11 reflections. Our September 11 programs began with show #328, WTC Reflections. Shows #329-330 welcomed guest Emily Doolittle, and we had a recently-received releases show (#331) the following week. October 13 saw our second WTC Reflections (#332). We took a look at new trends in live & electronic performance (#333) and improvisation (#334), followed by a surprise visit from composer Fred Szymanski on show #335. Our final September 11 reflections, The Towers Recalled III, was show #336, and we just completed our on-the-road visit with Martín Alejandro Fumarola on show #337-338. They are all here! There is a new essay by Scott Johnson, The Counterpoint of Species. Don't miss it! Ten chapters of insight and challenge! Also check out the other 50 essays by composers. The New York Times article, "Elegies and Tone Poems Respond to Tragedy," appeared on Monday, October 29. Read Matthew Mirapaul's thoughtful piece about The September 11 Musical Gallery on K&D. A Musical Gallery of the September 11 Tragedies contains the music sent to us in response to our request. More than 50 compositions can be heard in a 6-hour online concert. We have replaced our previous site search with the WhatUSeek search. Although we've been reluctant to use an off-site searcher because of the advertising and desire for local control over our indexing, it's become important to get the search feature back up and running. So if you like it, please tell us! The following sponsors made possible the Ought-One Festival (in order of contribution): Matthew Fields, Northfield Savings Bank, Carson Cooman, David Drucker, Trans-Video.Net, Charlie Messing, Jean Piché, Erling Wold, Jeff Harrington, Alfredo Santos, Anonymous EM, P. Kellach Waddle, Steve Rathe, Activist Music, David Baird, Dean Dierschow, Daron Hagen, Tom Hamilton, Beata Moon, Tim Thompson, Jeana Malachowski, Linda Catlin Smith, Anthony Cornicello, Juliet Kiri Palmer, Jacques Bailhé, Larry Austin, Don Corson, Susan Bettmann, Belinda Reynolds, Patricia Goodson, Dave & Sue Poitras, Mike Swinchoski, John Kennedy, ASCAP, William Pfaff, Emily Doolittle, Robert Bonotto, Tom Duff, Ian Chuprun, Argosy Foundation, Steve Layton, Kathy Supové, Randy Woolf, Moshe Budmor, Erik Nielsen, Carlos Haase, Frog Peak Music, Mark Gibbons, Greg Hall, Patrick Grant, Richard DeCosta, Robert D. Polansky (matched by HMCo. ), Josephine M. Maggio, Martin Schiff, Joseph Benzola, Susan Lyon, Brad Smith, David Dramm, Anne LaBerge, Laurie Hollander, Eleanor Dimoff, Aggie Birdsong Smee, Antonio Celaya, Timothy Nelson, Gary Barwin, *Kawai Shigeru Piano Company, Randy Hostetler Living Room Music Fund, Jenny Undercofler, Christopher Penrose, Vermont League of Cities and Towns, Lorraine Day, Janet Ressler. New Composer to Distort; New Show! Show#338 is now posted. It is part 2 of the interview with Martín Alejandro Fumarola, and some great new releases. Have you missed the special offers to support K&D's projects? CDs from Pogus, Logos, THUMP, Margaret Lancaster, Mary Lou Newmark, Waveformation, James Bohn, MaltedMedia, Frédéric Rossille; Festival T-shirts; Vermont composer mugs; 100-page program/essay book, and special 1- and 3-CD limited editions of "NonPop NoBounds" from on-air K&D performances and presentations. For those waiting: the special editions are done and just about ready to ship! Shows #328-337 are now available! Catch up with interviews you missed, along with our special September 11 reflections. Our September 11 programs began with show #328, WTC Reflections. Shows #329-330 welcomed guest Emily Doolittle, and we had a recently-received releases show (#331) the following week. October 13 saw our second WTC Reflections (#332). We took a look at new trends in live & electronic performance (#333) and improvisation (#334), followed by a surprise visit from composer Fred Szymanski on show #335. Our final September 11 reflections, The Towers Recalled III, was show #336, and we just completed the first part of our on-the-road visit with Martín Alejandro Fumarola on show #337. They are all here! Our audio is available on the kalvos.org server at pair Networks. It is sponsored by the Princeton String Academy. More information and a link soon -- our thanks to them! Viva violas! Our audio is now functioning on the kalvos.org server at pair Networks. Because there is no Real Audio server, it is not possible to scan through the audio quickly. The live Saturday cybercast will return in late November. There is a new essay by Scott Johnson, The Counterpoint of Species. Don't miss it! Ten chapters of insight and challenge! The New York Times article, "Elegies and Tone Poems Respond to Tragedy," appeared on Monday, October 29. Read Matthew Mirapaul's thoughtful piece about The September 11 Musical Gallery on K&D. The old goddard.edu server is gone. That's where all our shows were stored, and we wave a grateful goodbye to its service over the past six years. We are moving all our audio to the kalvos.org server at pair Networks, in progress over the course of October 27-31. The live Saturday cybercast is presently down, but will return in November. We still need a sponsor (perhaps you?) for the move of kalvos.org to a high-capacity server. The special support from pair Networks still results in a net increase to K&D of $100 per month. Contact us if you will sponsor this for a year. Once we finish uploading the archives, the latest shows will be converted within a few days of broadcast and posted to kalvos.org. When the live stream returns, we'll return to our usual laggard ways. Hybrids, Thoroughbreds, and Survival is a new essay by Scott Johnson, now available on the site. Also check out the other 50 essays by composers. A reminder that A Musical Gallery of the September 11 Tragedies is available, containing the music sent to us in response to our request. More than 40 compositions can be heard in a 6-hour online concert. Critical audio files will be moved to kalvos.org and access to them will be transparent. We have only 100MB of space left at kalvos.org, so only the most important files will be moved. The latest shows will be archived within a few days of broadcast and posted to kalvos.org. Because of their size (approximately 18.5MB each), the shows will be limited to the last month's archives until the goddard.edu server returns. A reminder that A Musical Gallery of the September 11 Tragedies is available, containing the music sent to us in response to our request. If you are interested in mp3 files from our September 11 Gallery, now is the time to get them. They will also be off-line during the goddard.edu rebuild (or until we find a sponsor for the kalvos.org move to a high-capacity server). The RealAudio files will remain in place. We're asking your patience with our audio files on the goddard.edu server. That's where all our shows are stored; something is amiss, and service is slow to nil. We've moved some of our audio to the pair server, but are running out of space (see September 21 notice). T-shirts, mugs, CDs, and other goods are available. Our latest shows are ready! #319-327 are up, with interviews as well as our Ought-One Festival samplers. Here the complete interviews with Samuel Vriezen and Martijn Voorvelt recorded in Amsterdam (#319-320), the altered states of David Stevens recorded in Bishop's Stortford UK (#321), an in-studio visit with David Heuser (#322), the interesting experiences of new music entrepreneur André Posman recorded at De Rode Pomp in Ghent (#323), and the two-part conversation with Guy de Bièvre recorded at the Logos Foundation in Ghent (#326-327). The Ought-One Festival of Nonpop on August 25-26 in Montpelier, Vermont is over, with wonderful results. nearly 40 concerts and presentations and installations took place, and you can read about it on the Ought-One Festival Homepage. There are the wonderful news and reviews of the Festival, going up as we receive them, and you can see the wonderful drawings created by Robert Bonotto. We're still about $1900 short of paying for Ought-One, so if our Urgent Appeal didn't pop up automatically, please click here. Don't miss the bonus CDs offered for contributions in our popup, and souvenir passports, T-shirts, CDs, etc.! Free gifts with contributions, too. The following sponsors made possible the Ought-One Festival (in order of contribution): Matthew Fields, Northfield Savings Bank, Carson Cooman, David Drucker, Trans-Video.Net, Charlie Messing, Jean Piché, Erling Wold, Jeff Harrington, Alfredo Santos, Anonymous EM, P. Kellach Waddle, Steve Rathe, Activist Music, David Baird, Dean Dierschow, Daron Hagen, Tom Hamilton, Beata Moon, Tim Thompson, Jeana Malachowski, Linda Catlin Smith, Anthony Cornicello, Juliet Kiri Palmer, Jacques Bailhé, Larry Austin, Don Corson, Susan Bettmann, Belinda Reynolds, Patricia Goodson, Dave & Sue Poitras, Mike Swinchoski, John Kennedy, ASCAP, William Pfaff, Emily Doolittle, Robert Bonotto, Tom Duff, Ian Chuprun, Argosy Foundation, Steve Layton, Kathy Supové, Randy Woolf, Moshe Budmor, Erik Nielsen, Carlos Haase, Frog Peak Music, Mark Gibbons, Greg Hall, Patrick Grant, Richard DeCosta, Robert D. Polansky (matched by HMCo. ), Josephine M. Maggio, Martin Schiff, Joseph Benzola, Susan Lyon, Brad Smith, David Dramm, Anne LaBerge, Laurie Hollander, Eleanor Dimoff, Aggie Birdsong Smee, Antonio Celaya, Timothy Nelson, Gary Barwin, *Kawai Shigeru Piano Company, Randy Hostetler Living Room Music Fund, Jenny Undercofler, Christopher Penrose, Vermont League of Cities and Towns, Lorraine Day. We have replaced our down searcher with the WhatUSeek searcher. Although we've been reluctant to use an off-site searcher because of the advertising and desire for local control over our indexing, it's become important to get the search feature back up and running. So if you like it, please tell us! Our www.goddard.edu server has been up and down for two days, meaning our audio files are variously off line. Combined with the crippling effect of a four-month loss of our search feature, we are wondering how to approach this problem for the long term. We are now on line for six years (and have won national awards for our work), yet have jockeyed our audio around several times, from local home servers to AudioNet to Broadcast.com and to our generous but overstressed Goddard hosts. Kalvos.org itself has been stable for some time, and would be our choice for a permanent home, but its disk space limit is 400MB -- one-twelfth what K&D uses today. We don't have the budget for our own connection (T-1 is $1,800/month in this area), and commercial web space is still costly, considering what we consume (even at $.10 per MB overcharges, our site would cost $480/month). We're exploring this with the kalvos.org service provider (the acclaimed pair networks, whose uptime vanishingly approaches 100%), but have no solution yet. Ideas are welcome (along with open credit card accounts!). A Musical Gallery of the September 11 Tragedies is now available, containing the music sent to us in response to our request. The most recent show archive ("Lower Manhattan", #328) is now available on our listening pages. September 16th was our 6th anniversary online, but we'll postpone the celebrations until another time. The most recent show archive ("Lower Manhattan", #328) will be posted sometime Sunday, September 16 on our listening pages. This is our 6th anniversary online, but we'll postpone the celebrations until next week. K&D will pause in its regular interview schedule this Saturday, September 15. The interview with Emily Doolittle will be postponed to September 22 as we do a little on-air meditation. Our latest shows are ready! #319-327 are up, with interviews as well as our Ought-One Festival samplers. Here the complete interviews with Samuel Vriezen and Martijn Voorvelt recorded in Amsterdam (#319-320), the altered states of David Stevens recorded in Bishop's Stortford UK (#321), an in-studio visit with David Heuser (#322), the interesting experiences of new music entrepreneur André Posman recorded at De Rode Pomp in Ghent (#323), and the two-part conversation with Guy de Bièvre recorded at the Logos Foundation in Ghent (#326-327). There are two Ought-One Festival preview samplers as well (#324-325). These join the wild and energetic double-teaming Kalvos received from Moniek Darge and Godfried-Willem Raes (#315-316), the incisive performer-as-composer comments of Bill Trimble (#317) and a live visit with the diverse and expressive composer Mark Gibbons (#318). The following sponsors made possible the Ought-One Festival (in order of contribution): Matthew Fields, Northfield Savings Bank, Carson Cooman, David Drucker, Trans-Video.Net, Charlie Messing, Jean Piché, Erling Wold, Jeff Harrington, Alfredo Santos, Anonymous EM, P. Kellach Waddle, Steve Rathe, Activist Music, David Baird, Dean Dierschow, Daron Hagen, Tom Hamilton, Beata Moon, Tim Thompson, Jeana Malachowski, Linda Catlin Smith, Anthony Cornicello, Juliet Kiri Palmer, Jacques Bailhé, Larry Austin, Don Corson, Susan Bettmann, Belinda Reynolds, Patricia Goodson, Dave & Sue Poitras, Mike Swinchoski, John Kennedy, ASCAP, William Pfaff, Emily Doolittle, Robert Bonotto, Tom Duff, Ian Chuprun, Argosy Foundation, Steve Layton, Kathy Supové, Randy Woolf, Moshe Budmor, Erik Nielsen, Carlos Haase, Frog Peak Music, Mark Gibbons, Greg Hall, Patrick Grant, Richard DeCosta, Robert D. Polansky (matched by HMCo. ), Josephine M. Maggio, Martin Schiff, Joseph Benzola, Susan Lyon, Brad Smith, David Dramm, Anne LaBerge, Laurie Hollander, Eleanor Dimoff, Aggie Birdsong Smee, Antonio Celaya, Timothy Nelson, Gary Barwin, *Kawai Shigeru Piano Company, Randy Hostetler Living Room Music Fund, Jenny Undercofler, Christopher Penrose, Vermont League of Cities and Towns. Ought-One Festival is Over: Phew! The Ought-One Festival of Nonpop on August 25-26 in Montpelier, Vermont is over, with wonderful results. 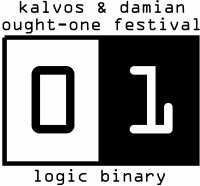 nearly 40 concerts and presentations and installations took place, and you can read about it soon (we're not updated yet) on the Ought-One Festival Homepage. We're still about $1900 short of paying for it, so if our Urgent Appeal didn't pop up automatically, please click here. Don't miss the bonus CDs offered for contributions in our popup, and souvenir passports, T-shirts, CDs, etc.! Free gifts with contributions, too. Next week's guest: Guy de Bièvre, part 2. Hear the mystery man in his own words! And learn who framed Milton Babbitt! Our latest shows are ready! #312-318 are up, with great interviews. Hear the conclusion of our conversation with Vanessa Lann (#311-312), and a two-part visit with Boudewijn Buckinx (#313-314), plus the wild and energetic double-teaming Kalvos received from Moniek Darge and Godfried-Willem Raes (#315-316). Also just up are the incisive performer-as-composer comments of Bill Trimble (#317) and a live visit with the diverse and expressive composer Mark Gibbons (#318). These join recently posted interviews with Frederic Rzewski (#307-308) and Yannis Kyriakides (#309-310), as well as the Low Countries Preview (#306). Don't forget the earlier 2001 visits with Claudio Calmens and his live concert (#300), our three-way Internet improvisation from Vermont, Georgia, and Japan with Robert Duckworth, Roddy Schrock, and Tadashi Usami (#304), our Cheap History of Time (in two parts, #298 and #301); our Cheap History of Computers in Music (#302 and #303); and our homage to Iannis Xenakis (#299). Ought-One is Three Weeks Away! The Ought-One Festival of Nonpop is August 25-26 Due to expected large audiences, the Ought-One Festival of Nonpop has moved to downtown Montpelier, Vermont. Tickets are on sale on line right now!. Get 'em before we're sold out! Wondering if you should come? Listen to our shows the next two weeks ... they're previews of the Ought-One Festival, with selections from the composers and performers. If our Urgent Appeal didn't pop up automatically, please click here. Don't miss the bonus CDs offered for contributions in our popup! We believed the companies who benefit ultimately from the work of composers -- technology companies, music companies, instrument companies, music software companies -- would be ready to sponsor the first cross-genre festival of nonpop, Ought-One. And a few wonderful organizations have come through, including Coda Music Technology (the Finale people), Pogus, OO Discs, ASCAP, Trans-Video.Net, and our own Northfield Savings Bank. But most generous have been personal contributors and underwriters. So the charity model is back in play, and we need your immediate $15,000 in contributions now via PayPal or via our funding page. Ought-One has moved! Due to expected large audiences, the Ought-One Festival of Nonpop has moved to downtown Montpelier, Vermont, on August 25-26. And tickets are on sale on line right now!. Get 'em before we're sold out! The following sponsors are making possible the Ought-One Festival so far (in order of contribution): Matthew Fields, Northfield Savings Bank, Carson Cooman, David Drucker, Trans-Video.Net, Charlie Messing, Jean Piché, Erling Wold, Jeff Harrington, Alfredo Santos, Anonymous EM, P. Kellach Waddle, Steve Rathe, Activist Music, David Baird, Dean Dierschow, Daron Hagen, Tom Hamilton, Beata Moon, Tim Thompson, Jeana Malachowski, Linda Catlin Smith, Anthony Cornicello, Juliet Kiri Palmer, Jacques Bailhé, Larry Austin, Don Corson, Susan Bettmann, Belinda Reynolds, Patricia Goodson, Dave & Sue Poitras, Mike Swinchoski, John Kennedy, ASCAP, William Pfaff, Emily Doolittle, Robert Bonotto, Tom Duff, Ian Chuprun, Argosy Foundation, Steve Layton, Kathy Supové, Randy Woolf, Moshe Budmor, Erik Nielsen, Carlos Haase, Frog Peak Music, Mark Gibbons, Greg Hall, Patrick Grant, Richard DeCosta, Robert D. Polansky (matched by HMCo. ), Josephine M. Maggio, Martin Schiff, Joseph Benzola, Susan Lyon, Brad Smith. André Posman is next week's guest on K&D. What's different about André? He's the first guest who's neither composer nor performer. Instead, André is a musical entrepreneur dedicated to new music with energy and cash, at De Rode Pomp in Gent, Belgium. It's different, so join us Saturday! Future guest schedule is here. Our search feature remains broken as the Goddard servers are moved and upgraded. Continued apologies for the inconvenience. Ought-One Poster! Get it now from The Ought-One Festival of Nonpop Home Page. Our latest newsletter is posted. Read everything that's going on with K&D. If our Urgent Appeal didn't pop up automatically, please click here. We believed the companies who benefit ultimately from the work of composers -- technology companies, music companies, instrument companies, music software companies -- would be ready to sponsor the first cross-genre festival of nonpop, Ought-One. And a few wonderful organizations have come through, including Coda Music Technology (the Finale people), Pogus, OO Discs, ASCAP, Trans-Video.Net, and our own Northfield Savings Bank. But most generous have been personal contributors and underwriters. for now, the charity model is back in play, and we need your immediate $15,000 in contributions now via PayPal or via our funding page. The following sponsors are making possible the Ought-One Festival so far (in order of contribution): Matthew Fields, Northfield Savings Bank, Carson Cooman, David Drucker, Trans-Video.Net, Charlie Messing, Jean Piché, Erling Wold, Jeff Harrington, Alfredo Santos, Anonymous EM, P. Kellach Waddle, Steve Rathe, Activist Music, David Baird, Dean Dierschow, Daron Hagen, Tom Hamilton, Beata Moon, Tim Thompson, Jeana Malachowski, Linda Catlin Smith, Anthony Cornicello, Juliet Kiri Palmer, Jacques Bailhé, Larry Austin, Don Corson, Susan Bettmann, Belinda Reynolds, Patricia Goodson, Dave & Sue Poitras, Mike Swinchoski, John Kennedy, ASCAP, William Pfaff, Emily Doolittle, Robert Bonotto, Tom Duff, Ian Chuprun, Argosy Foundation, Steve Layton, Kathy Supové, Randy Woolf, Moshe Budmor, Erik Nielsen, Carlos Haase, Frog Peak Music, Mark Gibbons, Greg Hall, Patrick Grant, Richard DeCosta, Robert D. Polansky (matched by HMCo. ), Josephine M. Maggio, Martin Schiff, Susan Lyon, Brad Smith. David Heuser is next week's guest, live on K&D. We have no idea what treats David has in store ... he'll be swooping into the studio, CDs in hand, with attitude ready to go. Join us and be as surprised as we are! We believed the companies who benefit ultimately from the work of composers -- technology companies, music companies, instrument companies, music software companies -- would be ready to sponsor the first cross-genre festival of nonpop, Ought-One. We are still working on it, but we're stunned by how quickly wealthy companies go into hiding when it requires being on the cutting edge. So for now, the charity model is back in play, and we need your immediate $17,000 in contributions now via PayPal or via our funding page. The following sponsors are making possible the Ought-One Festival so far (in order of contribution): Matthew Fields, Northfield Savings Bank, Carson Cooman, David Drucker, Trans-Video.Net, Charlie Messing, Jean Piché, Erling Wold, Jeff Harrington, Alfredo Santos, Anonymous EM, P. Kellach Waddle, Steve Rathe, Activist Music, David Baird, Dean Dierschow, Daron Hagen, Tom Hamilton, Beata Moon, Tim Thompson, Jeana Malachowski, Linda Catlin Smith, Anthony Cornicello, Juliet Kiri Palmer, Jacques Bailhé, Larry Austin, Don Corson, Susan Bettmann, Belinda Reynolds, Patricia Goodson, Dave & Sue Poitras, Mike Swinchoski, John Kennedy, ASCAP, William Pfaff, Emily Doolittle, Robert Bonotto, Tom Duff, Ian Chuprun, Argosy Foundation, Steve Layton, Kathy Supové, Randy Woolf, Moshe Budmor, Erik Nielsen, Carlos Haase, Frog Peak Music, Mark Gibbons, Greg Hall, Patrick Grant, Richard DeCosta, Robert D. Polansky (matched by HMCo. ), Josephine M. Maggio, Martin Schiff. David Stevens is next week's guest. This unusual interview, recorded at Bishop's Stortford in the U.K., will feature an uninterrupted mix of David's comments and his music. We hope this will be a work of art in itself! Come to K&D and listen to it! Best of the Bazaar #59, #60, #61 and #62 are ready! Listen to these remarkable sound compositions based on K&D shows by David "Damian-or-is-it-Kalvos?" Gunn. New essays by David Alarcón Folgado. Read Con Pentagramas en las Gafas Todo es Música and No quiero éste, quiero el otro. Then check out all the composer essays on K&D. Samuel Vriezen and Martijn Voorvelt are back as next week's guests for part 2 of our interview, as recorded before the Tot en Met XXII concert in Amsterdam in April. Our search features is still broken as the Goddard servers are moved and upgraded. Continued apologies for the inconvenience. Vriezen and Voorvelt Next Week! Samuel Vriezen and Martijn Voorvelt are next week's guests, as recorded before the Tot en Met XXII concert in Amsterdam in April. Mark Gibbons Comin' Up Live! Mark Gibbons is next week's guest. He's coming live to the studio, so ya nevah know what's gonna happen. The Ought-One Festival of Nonpop schedule is now available. More than 30 concerts are now in place; but the tentative schedule of concerts and events for Saturday and Sunday, August 25-26, is now available.. The individual concerts begin the list; the schedule grid is at the bottom of the page. This week's guest is Bill Trimble. Hear the master saxophonist and composer talk about style, experience, and the relationship with other composers. Our upcoming guest list is adjusted. Mark Gibbons will join us live on June 30 and David Heuser will join us live on July 28. Vermont's WCVT and WDEV have joined in sponsoring the Ought-One Festival of Nonpop. The O1 Fest continues to gain momentum and get us dizzy! Please visit the Ought-One site for Festival info, schedules, tickets, etc. Our search features is temporarily broken as the Goddard servers are moved and upgraded. Apologies for the inconvenience. This week's guests are again Moniek Darge and Godfried-Willem Raes. Hear the Logos Duo get into it on style, substance, history, and male-female differences in composition. Also, our upcoming guest list is adjusted. Mark Gibbons will join us live on June 30, David Heuser will join us live on July 28, and Bill Trimble is now scheduled for August 11. Gaudeamus Foundation, Pogus Records, The Argosy Foundation, Consortium of Vermont Composers are supporting the Ought-One Festival of Nonpop. $51,000 remains toward our goal for the Festival on August 25-26. Please sponsor a composer or event for the Ought-One Festival. $500 sponsors a composer's attendance and performance. We need 100 sponsors for the Festival. Sponsors now via PayPal, or go to our funding page. Ought-One Schedule of Events! Find events at The Ought-One Festival Concert Schedule. Our latest shows are ready! #306-311 are up, so don't miss our two-part interviews with Frederic Rzewski, Yannis Kyriakides, and Vanessa Lann, as well as the Low Countries Preview. These join recently posted interviews with Claudio Calmens (#300), our three-way Internet improvisation from Vermont, Georgia, and Japan with Robert Duckworth, Roddy Schrock, and Tadashi Usami (#304), our Cheap History of Time (in two parts, #298 and #301); our Cheap History of Computers in Music (#302 and #303); and our homage to Iannis Xenakis (#299). This week's guest is Boudewijn Buckinx. And you think you know what the post-new-romanticism is all about? Well, you don't. Listen to Boudewijn and hear revelations. Also, our upcoming guest list is adjusted. David Heuser will join us live on July 28, and Bill Trimble is now scheduled for August 11. Great new interviews just recorded in Europe for broadcast this spring and summer -- see our 2001 Shows Page for the schedule of upcoming guests, including Boudewijn Buckinx, recorded at his Tervuren home;Godfried-Willem Raes and Moniek Darge, recorded at the Logos Foundation, Ghent, along with a live performance; Guy de Bièvre, also recorded at the Logos Foundation, Ghent; Samuel Vriezen and Martijn Voorvelt, recorded at the Posthoornkerk, Amsterdam, along with a percussion/violin concert; Martijn Padding, recorded in his Amsterdam home and on the road from Bergen; André Posman, recorded at De Rode Pomp, Ghent; David Stevens, recorded in a B&B in Bishop's Stortford, UK; and Bill Trimble, Emily Doolittle, Dartmouth New Musics Concert and others that are recorded and will be announced. The Ought-One Festival needs funds now! $55,000 remains toward our goal for the Festival on August 25-26. Please sponsor a composer or event for the Ought-One Festival. $500 sponsors a composer's attendance and performance. We need 100 sponsors for the Festival. Sponsors now via PayPal, or go to our funding page. Our latest shows are ready, but problems accessing our Goddard server has delayed their availability (read: permissions got blown & we can't upload the files!). We'll let you know as soon as they're ready. Next week's guest is Boudewijn Buckinx. And you think you know what the post-new-romanticism is all about? Well, you don't. Listen to Boudewijn and hear revelations. Also, our upcoming guest list is adjusted. David Heuser will join us live on July 28, and Bill Trimble is now scheduled for August 11. The Ought-One Festival needs funds, and we mean it! $56,000 is our goal between now and the Festival on August 25-26. Please sponsor a composer or event for the Ought-One Festival. $500 sponsors a composer's attendance and performance. We need 100 sponsors for the Festival. Contribute now via PayPal, or go to our funding page. Vanessa Lann is next week's guest. Hear part 2 of this interview with Vanessa providing detailed roadmaps to her work. Powerful and astonishing music for voice, flute, ensembles, and more. If hearing an articulate composer is what you want, this is it! with 75 composers and performers from around the world. the Afro-Caribbean Jazz Seminar with the Eddie Palmieri Octet. an adventure devoted to 8-channel diffusion. We begin 7 years on the air in May. Good for us (I think! ), but we've run in the red every year. We may go to a subscription model for our show archives. We can avoid that. Our counter shows 266,737 visitors since 1997, more than 24 million hits (based on our visitor:hit stas). If every page visitor had contributed a penny per hit since we began, we'd have paid for the show, site, the upcoming Ought-One Festival and, our transcription and resources projects, as well as CDs of the live performances. We may indeed ask for subscriptions to our upcoming Festival, but contributions now can avoid all of that. If you're reading this, Contribute now via PayPal, or go to our funding page. Thank you! New shows are posted!. We're back from our Low Countries interview tour, our hardware is working again (What, coming home to no power, no water, no heat, no Internet, and boiling snow on the wood stove? Ouch!) so shows #298-304 are finally available. Hear our interview with Claudio Calmens (#300), our three-way Internet improvisation from Vermont, Georgia, and Japan with Robert Duckworth, Roddy Schrock, and Tadashi Usami (#304), our Cheap History of Time (in two parts, #298 and #301); our Cheap History of Computers in Music (#302 and #303); and our homage to Iannis Xenakis (#299). Yannis Kyriakides is next week's guest. Hear part 2 of this terrific interview with Yanni and his subtle and astounding music for voice, electronics, percussion, virginal, and other eclectic combinations. Yannis Kyriakides: Very much what's next in new music! The silly continues. We have arranged to use the famous AlexWarp Java applet by Alex Rosen. It was popularized during the U.S. presidential election and even mentioned in Time. So ask for your favorite K&D guest composers, and we'll put 'em up for distortion. Third face up on K&D's Distort-a-Composer Page is James Bohn. Distort him! Make your music reviews or papers perceptive and punchy! Our bull**** generator is the perfect antidote to bad performances! Please offer to sponsor a composer for the Ought-One Festival. $500 sponsors a composer's attendance and performance. We need 100 sponsors for the Festival. You can sponsor via PayPal, or go to our funding page. Yannis Kyriakides is next week's guest. On April 28, hear the broadcast of Yannis's subtle and astounding music for voice, electronics, percussion, virginal, and other eclectic combinations. Yannis Kyriakides: Very much what's next in new music! Frederic Rzewski is next week's guest. On April 21, hear the first performance of Frederic's new Piano Variation, finished the day we interviewed him! Please take this opportunity to contribute to K&D's projects. The gift we received in October from the Argosy Foundation gave us some planning room. Now we're asking for your continued support by helping Kalvos & Damian complete the work of transcribing interviews, presenting more composers to listeners, and deepening this long-time web resource. The K&D site received 60,000 visitors and over 5 million "hits" in 2000, with fourteen monetary contributions during that time. Head for our contact page to mail us a contribution, go to our funding page to read more about what we do and how your contribution will be used and how it is tax-deductible (to the extent provided by law, etc., etc. ), or simply click this link to make a PayPal contribution or click any one of the PayPal icons found on every K&D page (if you sign up through our link, we'll also get a $5 bonus). Help us move ahead with the cool composers you've met on Kalvos & Damian's New Music Bazaar. Kalvos & Damian's latest report to contributors is available in PDF format. There was no K&D show on March 31. Heavy snow caused power failures throughout northern Vermont, and both the studio/transmitter and servers were taken down. Show No. 306 -- a preview of our European guests for this year -- is postponed to April 7. March 24 playlists are up. Finally, after a European tour, plane failures, massive snow, power failures, and server issues, our March 24 playlist is available. Phew. We gotta move. Lotta catchin' up to do. We'll be posting announcements in the next few weeks. Great new interviews just recorded in Europe (see the latest playlist for upcoming guests), more on the Ought-One Festival and its 80 composer appearances, and more archived shows for your pleasure. Our kalvos.org and goddard.edu pages are out of sync due to access issues at goddard.edu. It's a minor problem, but won't be fixed until April 1, when Kalvos returns from an interview tour in Amsterdam, Brussels, and Gent. That also means playlists for the March 24/31 shows won't be up until then. Contraptionology. What? Next week, when Kalvos is on the road brushing interviews into the basket for this spring, Damian will let you know what Contraptionology is all about. March 24! Robert Duckworth, Roddy Schrock, and Tadashi Usami were our guests on March 17. If you missed this show created live as a trio on the Internet from Georgia and Tokyo, look for the archived show in a few weeks. This was a killer show! An hour-long electroacoustic creation started with Robert's stream from Macon, Georgia, sent to Tokyo, where Roddy and Tadashi further developed it with their own electroacoustic work, and sent a stream directly to Kalvos & Damian in Vermont. Brilliant! We'll let you know when this show is posted. Robert Duckworth March 17. Be sure to tune in March 17 for Robert Duckworth's live appearance on K&D. And next week, we'll have the second part of our Cheap History of Computers in Music. The Ought-One Festival is on! Read the first announcement, get excited, and get your plane tickets ready! ... the Ought-One Festival happens August 25-26 in and around WGDR and Goddard College in Plainfield, Vermont. Dozens of composers and performers playing the music you've heard on K&D. Live chamber and electronic music, electroacoustic sound, interactive installations, performance art, private events, you name it! Take your shirt off, or it'll get blown off (which is okay because we'll have Ought-One Festival shirts available)... what a weekend this will be! The Ought-One Festival is on! Full details will be coming soon, but get your plane tickets ready ... the Ought-One Festival happens August 25-26 in and around WGDR and Goddard College in Plainfield, Vermont. Dozens of composers and performers playing the music you've heard on K&D. Live chamber and electronic music, electroacoustic sound, interactive installations, performance art, private events, you name it! We'll post a page shortly as the Ought-One Festival develops, but take your shirt off. Or it'll get blown off ... what a weekend this will be! Next week's program (at last, after two postponements): A Cheap History of Time II. Music in one ear and out the other. The silly continues. We have arranged to use the famous AlexWarp Java applet by Alex Rosen. It was popularized during the U.S. presidential election and even mentioned in Time. So ask for your favorite K&D guest composers, and we'll put 'em up for distortion. Second face up on K&D's Distort-a-Composer Page is Margaret Lancaster. Distort her! 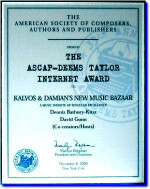 Our ASCAP-Deems Taylor Award news release is up. Read it & celebrate with us, and download this zip file of K&D's December 6 presentation at the awards ceremony. It's a 15MB chuck for only three minutes of show, and you'll need a fast PC to run it. But if you grab it, have fun! Kalvos & Damian announces the winner of the T-Shirt Design Contest: Mike Weinberger of Kailua Kona, Hawaii! His design will appear on our shirts, as well as become in mutilated form our new logo! Congrats to Mike, who wins a box of unlistenable CDs and other stuff! Next week: A Cheap History of Time II. Music in one ear and out the other. Shows #291-297 are now available. If you missed them live, now's the time to listen to the second set of shows in our Winter Anti-Solstice show (#291), the incredibly popular Composers' Wisdom series (#292-295), along with a birthday homage to David Tudor (#296), and a preview of composers coming to the Ought-One Festival along with newly received recordings (#297). In the Composers' Wisdom set, iterview clips and tunes from 48 composers span all the styles at the turn of the century. (The earlier series was broadcast in 1999 and is still available.) These join the previous shows, including recent interviews with David W. Solomons (#286 and #288), Alexander Abele (#289), and Brenda Hutchinson (#289-290). David gives us a perspective that you don't often hear on K&D -- the Renaissance Musician from multiple points of view. Alex reveals how he handles many styles, forms, and sizes with great craftsmanship. And Brenda takes her piano in the U-Haul and sings an "Eee-yah!" version of the Tennessee Waltz. Don't miss 'em! The Living Composers Project is being hosted by Kalvos & Damian, and is now available with late January updates! Check out the work by Dan Albertson. We'll be the Living Composers Project for our own reference point here at K&D. The K&D Ought-One Minifest is on! Maybe we'll call it KalvoLite. More info soon, but it looks like August 25-26 at the studios, with many great composers you always wanted to meet! We're planning the K&D Ought-One Minifest. Live in Studio Z as well as on the spacious WGDR grounds, we'll host a two dozen composers as well as Ensemble VCX with premieres and hot stuff. Look for announcements as the year progresses! It'll be in late Summer 2001, and you're invited -- live events and you can visit the K&D show. Interested? Contact K&D. We missed our deadline... so Kalvos & Damian didn't unveil its new site upgrade on time. Look for it soon ... navigation will be just as easy, and there will be no frames, invasive scripts, or other impediments. We'll keep our new, wonderful graphics. But we'll be updating and revamping composer pages, and finally getting to the upgrade of music resources, composer resources, and recording labels. We'll also give the graffiti page some revamping, and hope to get new goodies from the composers as well. Look for new music samples and interview clips. The New Year is your first opportunity to contribute to K&D's projects. The gift we received in October from the Argosy Foundation gave Dennis and David, the creators of Kalvos & Damian, a little planning room. Now, as the year opens, we're asking for your continued support by helping Kalvos & Damian complete the work of transcribing interviews, presenting more composers to listeners, and deepening this long-time web resource. The K&D site received 60,000 visitors and over 5 million "hits" in 2000, with fourteen monetary contributions during that time. Head for our contact page to mail us a contribution, go to our funding page to read more about what we do and how your contribution will be used and how it is tax-deductible (to the extent provided by law, etc., etc. ), or simply click this link to make a PayPal contribution or click any one of the PayPal icons found on every K&D page (if you sign up through our link, we'll also get a $5 bonus). Help us move ahead with the cool composers you've met on Kalvos & Damian's New Music Bazaar. How and where to submit material to K&D. Where our shows are archived for your listening. How to reach us with comments or questions. The history of our show since 1995, including topics and guests. How you can help with hands & cash. Listener Favorites and The New Besto Is Up! Next week (January 20) is the annual Listener Favorites show. Send us an email nominating your favorite piece from the past 25 years (that start is 1976, folks, so no Webern), preferably from among our composer guests. If we have it, we'll play it! Best of the Bazaar Mark LVIII is posted. David "Damian" Gunn hits us again in his uncanny style with yet another sound collage. Plunderphonics phooey! This is the real stuff, 200 proof. And if you're really nuts, you can list to all of them without pause for nearly seven hours. Happy New Year to all! We're planning on a great year of interviews, fun, and revelations, and hope you'll join us. We're wrapping up our Composers' Wisdom series next week -- brief comments by composers and one piece of their music. We enjoy the chance to reflect on and whoop along with the diversity of new music outside the "popular" genres. Along with the new US President, Kalvos & Damian will be unveiling a new site upgrade on January 20. Navigation will be just as easy, and there will be no frames, invasive scripts, or other silliness to stand in your way. We'll keep our new, wonderful graphics. But we'll be updating and revamping composer pages, and finally getting to the upgrade of music resources, composer resources, and recording labels. We'll also give the graffiti page some revamping, and hope to get new goodies from the composers as well. Look for new music samples and interview clips. The Living Composers Project is being hosted by Kalvos & Damian, and is now available! Check out the work by Dan Albertson. We'll be the Living Composers Project for our own reference point here at K&D. Shows #286-290 are now available. Hear interviews with David W. Solomons, Alexander Abele, and Brenda Hutchinson. David gives us a perspective that you don't often hear on K&D -- the Renaissance Musician from multiple points of view. Alex reveals how he handles many styles, forms, and sizes with great craftsmanship. And Brenda takes her piano in the U-Haul and sings an "Eee-yah!" version of the Tennessee Waltz. Don't miss 'em! The Listener Response Awards Page is finally up. Find out who won the awards for 1995, 1997, 1999, and 2000.